Southwest Healthcare Services Radiology Department provides a wide array of services. Our medical imaging department provides in-house services Monday through Friday from 7am-5pm and emergency room services on call evenings and weekends, 24/7, 365 days a year. All studies (except for echocardiograms) are interpreted by radiologists at CHI St. Alexius while echocardiograms are interpreted by cardiologists at the Heart and Lung Clinic. They are stored on their picture archiving and communication system (PACS), where they have the capability to be electronically sent almost anywhere in North Dakota and western South Dakota. General x-ray: Uses x-rays to provide one-dimensional images on phosphorus plates that are processed to a digital format. The entire department is board certified by the American Registry of Radiologic Technologists. 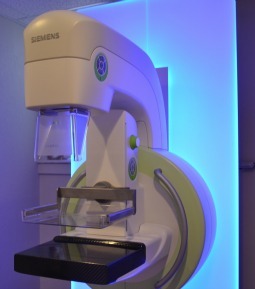 Full field digital mammography: Uses x-ray to image the breast as a screening tool for cancer. Our full field digital system utilizes a detector that processes images directly to a computer screen. The compression paddles are “flex” paddles and can make the exam more comfortable for the patient. Because of the improved workflow of the unit, exams can be completed in as little as 10 minutes. Southwest Healthcare Mammography is an ACR accredited facility with two technologists who have completed the necessary requirements for additional certification through the American Registry of Radiologic Technologists. Ultrasound: Uses sound waves to provide one-dimensional images in real time. We have one technologists certified by the American Registry of Diagnostic Medical Sonographers. Bone Densitometry: Our DEXA scanner is the gold-standard osteoporosis screening tool. 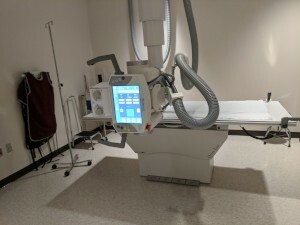 It uses low dose x-rays to measure bone density against a statistical average provided by the World Health Organization. We have one technologist board certified in this modality, but the entire department performs the exam. Body Composition Scans: Our DEXA scanner also has the capability of differentiating fat tissue from lean muscle tissue in a detailed, in-depth report. Computed Tomography: Uses x-rays to provide 3-dimensional imaging of the body. Providers can elect to use oral and/or IV contrast medium to further evaluate an area. The in-depth look at the body these scans provide allows our providers to more effectively detect a wide range of illnesses, including, but not limited to, cancer, stroke, and lung disease. The entire department is board certified in CT by the American Registry of Radiologic Technologists. 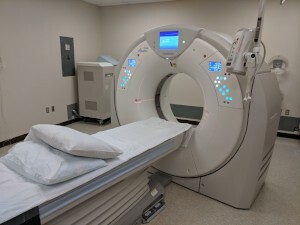 The CT scanner currently utilized at Southwest Healthcare Services is an Aquilion Prime, 80-slice, state-of-the-art machine. Magnetic Resonance Imaging: Uses radio frequencies and a large magnet to provide 3-dimensional imaging of common illnesses and injuries like soft tissue abnormalities, tumors, strokes, torn ligaments, and bulging disks. IV contrast media can also be administered to further evaluate an area of concern. Our services are provided by board certified technologists through MonDak Imaging Services. Echocardiography: Is an ultrasound examination of the heart. It provides real time images of the functionality and structure. Our services are provided by a board certified technologist through Dakota Imaging. Southwest Healthcare Services Radiology Department (701) 523-7177.